Jailbreaking is one of those things in life, while risky, can have big payoffs. FolderEnhancer pays back dividends with its ability to allow you to maximize your iOS organizing power by removing some of the “restrictions” set forth by Apple on how many apps you can place in a folder. Additionally, it has the added bonus of folder nesting (subfolders), something I personally have wanted for some time now. FolderEnhancer from Cydia does folders the way they should have been from Apple from the get-go by giving one the ability to put a virtually limitless number of apps in a folder. When a page in the folder gets full, you can horizontally scroll to the next page with the same visual cues and interaction you expect and are familiar with on the HomeScreen. Furthermore, FolderEnhancer empowers you to drop folders inside other folders—gasp—what a concept!? It is just as easy to do this as it is to drop apps inside folders. But wait, there’s more! This great app allows you to put a folder inside a folder that’s inside a folder that’s in another folder! YES—you read right—multi-level nesting of folders and apps! As if the app wasn’t great enough and didn’t already feed your obsessive compulsive need to organize every single app in every single manner first by category than by color followed by name, it does this all really really fast by overriding the default folder user interface. Don’t worry, your favorite peak-a-boo folder icons are the same; their chasmic open state is what changed. A simple (and larger) white-bordered pane springs open as if from nowhere, displaying your shiny apps in their perfect peking order. I would say folders now open about 50% faster than before (don’t quote this highly guestimated estimate). If you needed one more reason to go jailbreak, FolderEnhancer is it. It and MyWi are the two returns on investment I’ve received and use daily with my jailbroken iPhone 4. AppSafari review of FolderEnhancer was written by Kyle Hayes on March 18th, 2011 and categorized under Cydia Apps, Productivity, Utilities. Page viewed 5404 times, 2 so far today. 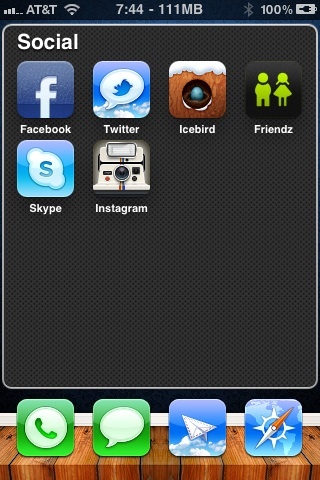 Need help on using these apps? Please read the Help Page.